A two-week lingering bout of cold and flu symptoms leading up to my TEDx talk in Hollywood left me in a panic, working all natural immune supporting remedies I had at hand. This bowl of garlic soup was among them. Garlic has natural anti-bacterial properties. In fact, a 2012 study compared the ability of a compound in garlic (diallyl sulphide) to two common antibiotics in killing the pathogenic bacteria Campylobacter jejuni. It found that the garlic compound was far more effective. Check out the result here — the diallyl sulphide result is represented by the gray dotted line that declines more rapidly than the others. 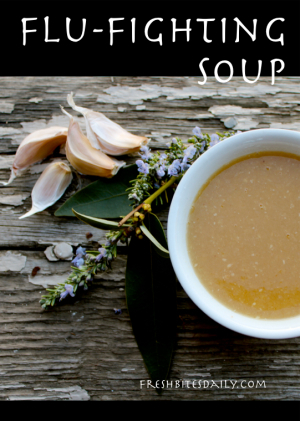 As you hack through the winter wanting relief but not looking for relief in a bottle of antibiotics, garlic soup is one good addition to your arsenal. How much garlic must you eat for relief? I’ve looked it up and I have no idea. I packed my soup with as much garlic as I had, a small mountain. I used caramelized onion as well for added flavor and nutrition. Should we be eating it raw or cooked? Perhaps both. First, I cannot fathom eating raw garlic soup in any real amount. Roasting garlic knocks down the heat. You can eat far more of it. It retains its benefits for the most part too. (Check out this article on garlic antioxidants and cooking here.) However, for the full range of benefit from any food, a mixed strategy is probably best. Raw garlic has benefits that we want to leverage when we’re fighting for our wintertime health. 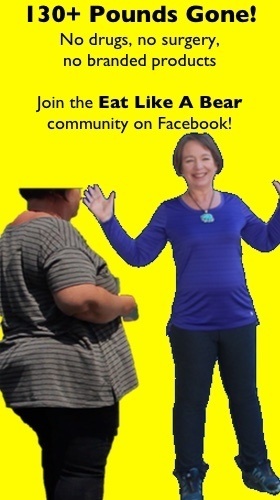 I asked our friend Carol Little, an herbalist who wrote the book “Cold + Flu Season: Are You Ready?” (here). She recommended a soup centered around roasted garlic but with finely sliced fresh garlic added to the final bowl. Add the raw garlic to taste. Some garlic carries more heat and we all have our limits. Your goal is to create a soup for yourself that you will enjoy eating. You will eat far more of it that way. Roast your garlic in advance. Here is a basic roasting method. After roasting, remove the garlic cloves from their peels. Begin to heat your broth. Cook onions on medium-high heat until they become translucent and begin to caramelize. When they are browning slightly, remove them from heat. Add the peeled roasted garlic, caramelized onions, and broth to a food processor. Puree until smooth. Depending on the size of your soup batch and your food processor, you may need to do this in several batches. Take care not to burn yourself with your hot ingredients. Place pureed ingredients back to a sauce pan and add the rosemary and bay leaf. Stir them in, cover, and let the mixture sit for about ten minutes. Remove the herbs. Your soup is ready. Roast garlic. Remove from peels. Slice onions and add them to a heated skillet that has been warmed with a bit of cooking oil. Cook onions on medium-high heat until they become translucent and begin to caramelize. 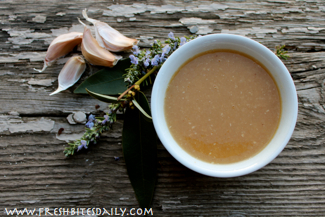 Puree roasted garlic, caramelized onions, and broth in a food processor. Place pureed ingredients back to a sauce pan and add the rosemary and bay leaf. Stir them in, cover, and let the mixture sit for about ten minutes. Remove the herbs. Your garlic soup is ready. Q: Can garlic soup be frozen? Can you freeze it? A: Yes, this soup freezes very well. Keep a stash on hand! Q: Can I have it with cream if I am sick? A: If cream and milk works well for you when you are sick, the flavor combination works well. Some people do have added problems with dairy and mucous when they are sick. If that’s you, I would leave it out until you are well. Potatoes? A: Yes, add them to the puree for some extra awesomeness. Egg? A: Yes, you could add the egg like you would for egg drop soup. It would be a nice touch of protein when you’re not feeling well. Coconut milk? A: No doubt. Spinach? A: Yes, add it to the puree or add the leaves to the hot and prepared soup.